Our Gossip Girl gang is growing up. Not necessarily maturing, but growing up. Their transition into adulthood is a major theme of this sixth and final season, and tonight saw the five core characters - Dan, Serena, Nate, Blair and Chuck - establish what they want to achieve as individuals. While last Monday's premiere brought the group back together again after the Season 5 finale scattered them, "High Infidelity" was an episode that set the stage for the remainder of the CW series. Dan is finding it more challenging than expected to release his hard-hitting Inside sequel. Plenty of people would run it, but not in the way he feels would deliver the maximum, destructive impact. With his sketchy literary agent in tow - Georgina is the highlight of Season 6 so far, whether she's watching him sleep or offering snarky commentary - the sometimes-bitter Muppet encountered resistance. Save for one unlikely ally. Nate may be portrayed unflatteringly in Dan's book (unless he's Mr. Irrelevant a second time), but the head of the struggling Spectator sees this as a literary marriage of convenience. He needs a major story to save the publication. Dan won't compromise by running his serialized UES expose unless it appears verbatim. Thus, Date came to a mutually beneficial agreement. It seems a little too perfect at this point. What happens when the first chapter gets published and the Spectator faces the inevitable blowback? How far is Nate willing to go to keep it in business? Moreover, if everyone easily linked the pseudonyms of Inside to the real-life Upper East Siders he dragged through the mud, what does Hard Luck Humphrey have to say that's SO shocking now? He's determined to make a name for himself on his terms, in any case, which is essentially Nate's goal as well. Whether either achieves it, and how long this tenuous pact lasts, are open questions. Serena and Nate both assumed their new significant others were cheating - with each other - but predictably, there was more to it. Steven being Sage's father was still unexpected, however. A sibling or cousin, we could see, but father and daughter? Neither Nate or Serena saw that coming, and just as surprisingly, both relationships ended the episode intact following the reveal. He's really okay with Nate dating his 17-year-old daughter? Hey, there are worse guys out there ... unless there are unrevealed ulterior motives involved with Serena and Nate's new loves. Clearly Sage has no problem lying, and things seem a little too perfect now. Like Serena's bid to take Manhattan as a respectable and responsible adult, the jury is still out on these two. Blair's road to fashion glory and stepping out of Eleanor's shadow hit a roadblock thanks to two blasts from the past: maligned former Constance classmate Nelly Yuki and faux-cialite Ponzi schemer Poppy Lifton. Being Queen B only gets you so far once you get out of high school, the younger Waldorf learned, as the bridges she burned came back to haunt her. Not sure we buy Nelly as a WWD reporter, but whatever. Having crashed and burned, B gave her staff a 10-day ultimatum, with the future of her company and future with the love of her life riding on Waldorf Designs' success hanging in the balance ... somehow. The whole together-but-apart bit feels a bit overblown and forced with lines like this. Chair can't get married if Waldorf Designs isn't massively successful or Bass Industries isn't returned to Chuck's control? Kind of a stretch, but they're wholly committed to this idea for the time being. Like his possibly future wife, Chuck is determined to become his own person and just the scion of a famous businessperson. In his case, though, this entails declaring a full-on, above-board war on Bart. He pressed his dad, his dad aggressively pressed back, and the younger Bass made his intentions clear. He also pressed Amira, only after which did he receive a clue. Who is the person in that photo? Hopefully this plot line picks up steam in the coming weeks, along with the others. With only eight weeks left in Gossip Girl's run, there's not much more time to waste. Let's get to it, right? 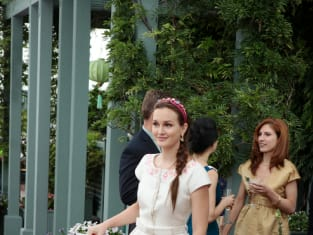 MEGA SPOILER ALERT: This Gossip Girl finale photo surfaced today. Barry Watson (Steven) is 38 and Sofia Black D'Elia (Sage) is 20. "No one in high school reads Gossip Girl anymore." Or watches it? Handsome Vacant would be a great Secret Service code name. Who doesn't get turned on by D saying "raw" and "hard"? Were Rufus and Ivy in bed this whole time? So, that brings us up to date. Did all of this make you more excited for the conclusion? Or is the show just running out the clock at this point? Sound off with on all things "High Infidelity" below!